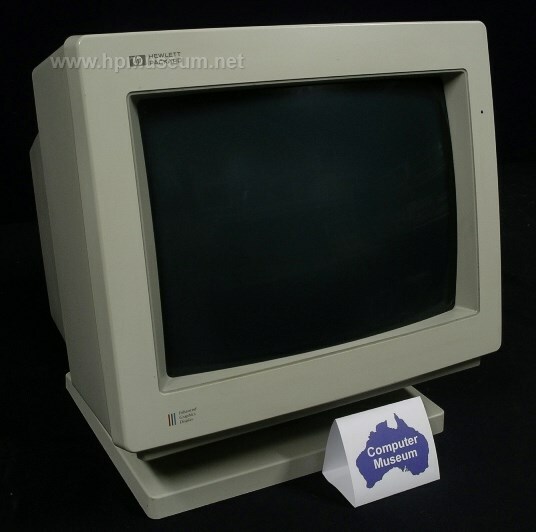 13-inch, color EGA monitor made by Mitsubishi for HP (no apparent equivalent Mitsubishi model number found). There were two models of the 35743 sold, the A and the B version. The A was 120V only and had a maximium resolution of 640 x 200 dots, the B model was 230V only and had a maximum resolution of 640 x 350 dots. These old monitors are getting on in years. The museum has a 120V 35743A that isnt working (on the list to be fixed) and as of October 2018, the museum's 35743B is operational again after replacing an internal 1A fuse and the STK7309 switching regulator. HP's repair approach for these units in the 1980's was to replace the entire monitor if it failed. The only thing the HP Customer Engineer had to do was swap the rear cover to the replacement unit so that the serial number of the unit stayed with the customer! The service manual in the Product Documentation provides a number of adjustments that could be done but, in practice, a replacement unit was the usual method of repair.